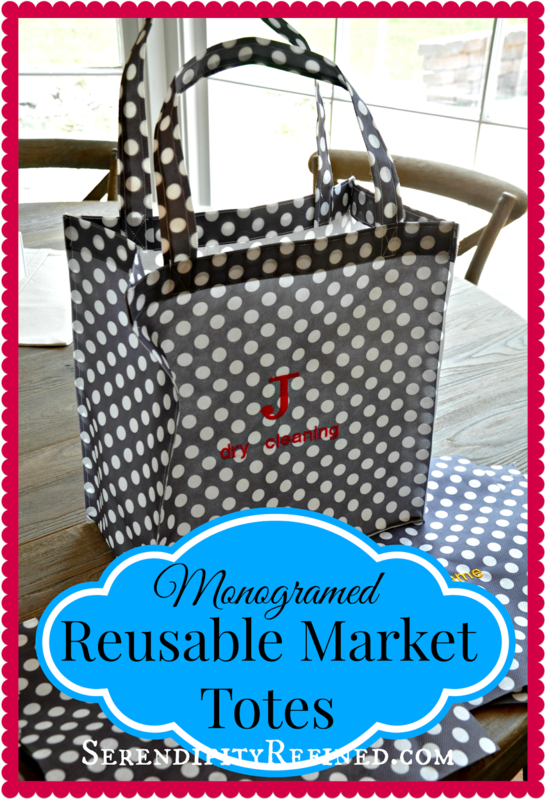 I've been using reusable market tote bags for several years but I've never really liked them. Oh, don't get me wrong, I love the idea of not using plastic bags. My main objection to the market bags that I've found is that they're usually ugly and most have advertising on them. Of course, I still use them, but having cute reusable totes with my initial on them is far better than the bad green ones with advertising for my local market that I've had for the past five years, right? In addition to using them for going to the grocer, my sister, my mom, and I use them as a way to corral and organize things that need to be taken each others' homes, to the dry cleaner, or to be returned. We started calling them "going home bags" a few years ago when my mom started filling reusable market bags with containers of holiday leftovers and, sometimes, things that we'd left at her house during prior visits. Pretty soon, these bags became a way of life for us and we found that, as our families grew and children moved into their own places, going home bags always seemed to be in short supply. Last week, when I was wandering through the aisles of JoAnn fabrics on Friday night (yeah, I know, I'm living the life...it was either that or tearing out the plywood in the living room...the decision was pretty easy for me), I happened upon what was labeled, "bag fabric" in the utility fabric aisle. As soon as I touched it, I knew what it was. 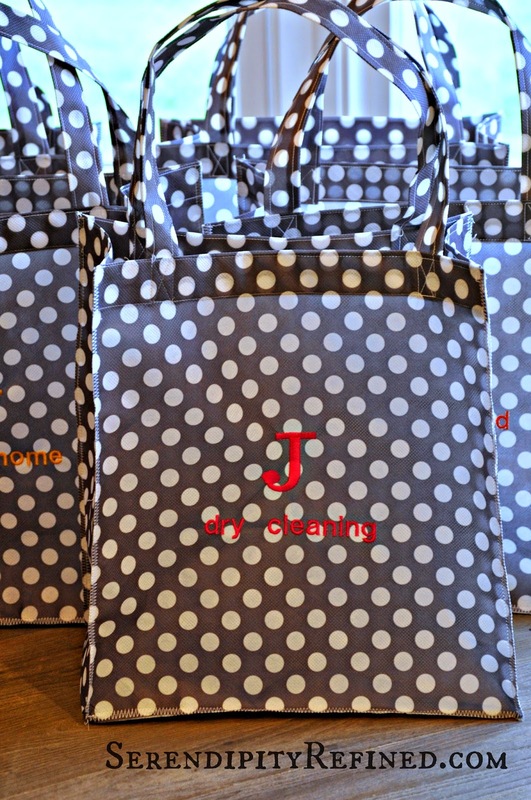 It was gray...with white polka dots and, after a few brief seconds spent marveling that someone actually thought of making what is clearly reusable bag fabric, I knew that I was going to have to make a few for my mom and sister for Mother's day. To be completely honest, the decision practically made itself when I saw that the 62 inch fabric was only $2.99 a yard! I purchased 5 yards (because I figured that each bag would take about 1/2 yard) and went home to make a pattern using one of my old totes as a reference. The cut list and simple sewing directions are below. 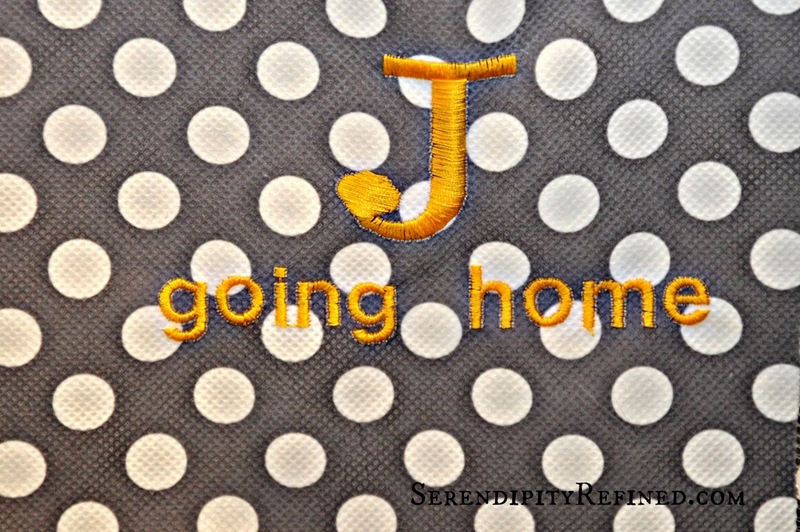 I embroidered the bags on my sewing machine but they could also be stenciled using fabric paint or monogrammed rubber stamps or Sharpie marker. The most difficult part was figuring out the pattern, after that, I made them assembly line style and I was able to complete them in an evening after work. Make handles, fold each piece in half lengthwise, fold under 1/2 inch along both of the long sides, and tuck them to the inside. stitch 1/4 inch from each edge. 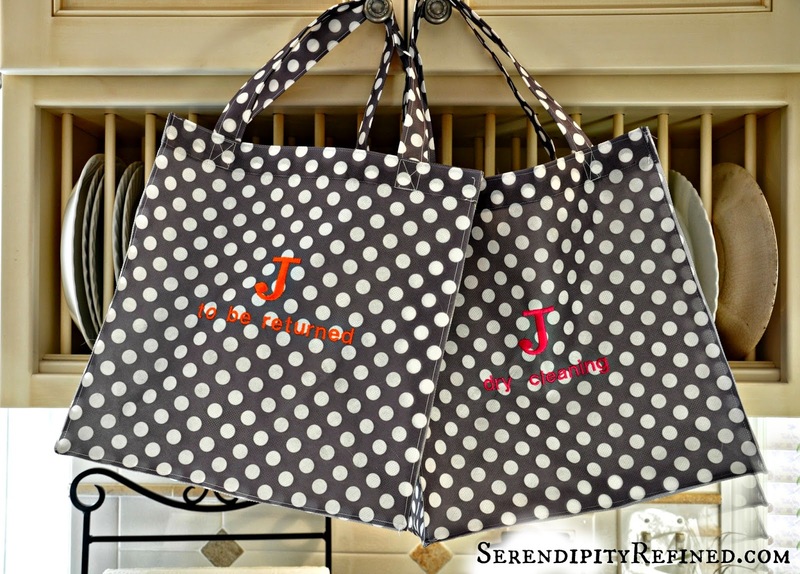 Make the bag sides: Paint or monogram one side of the bag (optional). Fold under 1 1/4 inches on the top and then folded it under again and stitched 1/4 inch from the top and bottom of the folded edges. Make the side/bottom: Fold under 1 1/4 inches at each short end, fold them under again and stitch 1/4 inch from the top and bottom of the folded edges. Assemble the bag: Pin one handle to the inside of each of the bag sides 2 inches from each side edge aligning the bottom of the handle with the bottom of the folded top edge. Stitch across the top, bottom and sides of the overlapping part of the handles. With wrong sides together, beginning on the top right side, pin the bag side/bottom to the bag front and stitch using a 3/8 inch seam allowance. Repeat for the bag back. Over lock the raw edges using a zig zag stitch. If you sew, I hope that you find time to make yourself some of these cute, reusable, market totes. 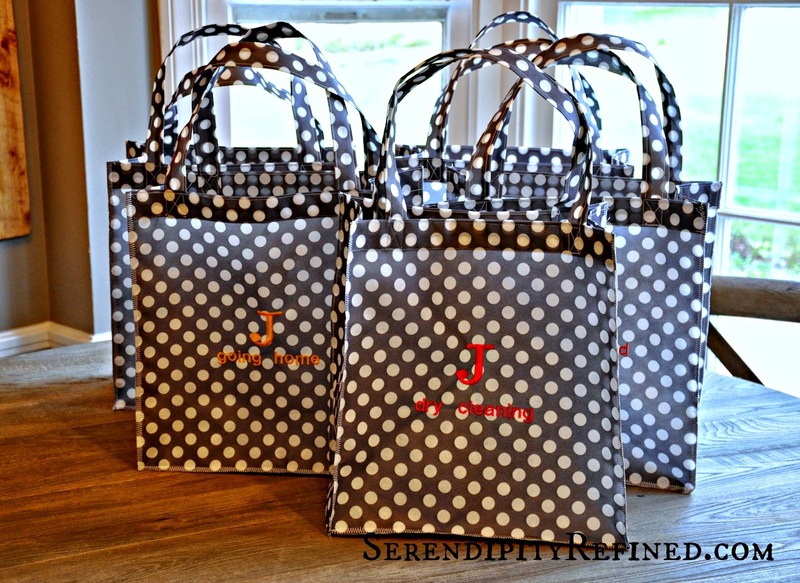 They're a great way to keep things like dry cleaning and returns organized and they make a cute gift for birthdays, and teachers. They'd be a super cute idea for a bride to be with the initial of her new last name!